bursting forth suddenly and lighting up the sky. "You are the light of the world. A city on a hill cannot be hidden; neither do people light a lamp and put it under a bowl. Instead, they put it on a stand and share the light with the entire house. 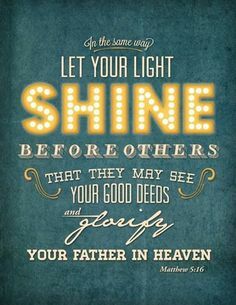 In the same way: let your light shine before men that they may see your good deeds and praise your Father in Heaven." for it is through the fire that we are made like pure gold. Yet, You call us ... friend. Lord, give new revelation to us all. For You are Holy ... Amen!